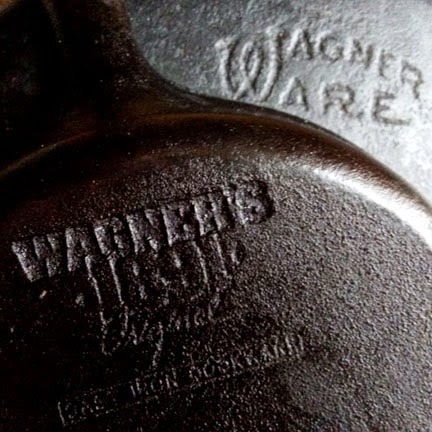 I’ve had this 11" wide Wagner Ware cast iron pan since the early ‘90s— a stoop sale find in Park Slope. I try to collect them when I can find them, especially the older ones with the original logo. It worked great until I lent it to a friend for a long camping trip. Three months later it came back scratched, unevenly blackened and sticky. From then on all food just stuck to it no matter how well I greased the pan and eventually the grease turned into tar. After a little exploration with a chisel I found that the pan had a layer of melted plastic over rust and grease; it looked like someone tried to heat up a vac-sealed bag of food directly in the pan instead of boiling it. Until then this was the best skillet I had for frying chicken or fish and making Korean BBQ beef; it has a thick base that heats evenly and it keeps a constant temperature on the range. Cast iron cookware is part of healthy cooking— a reliable source of dietary iron, especially when meals are made with acidified foods such as sauerkraut or kimchee. Not brand new but this gun-metal monster is back on the range. Take a look at my old cast iron skillet now! Good quality cast iron cookware is hard to come by at a decent price. As long as it’s not cracked or rusted straight through it’s always worth saving an old pan, griddle or Dutch oven. 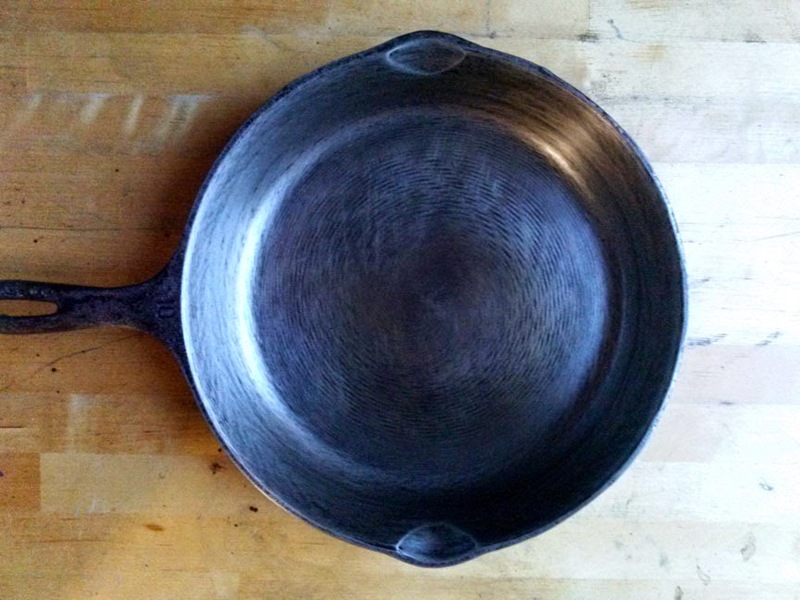 Over the years I’ve soaked this heavily tarnished pan with lye, taken steel wool and scouring powder to it and even put it into a hardwood fire for hours, yet all the usual recommendations for refurbishing cast iron didn’t work with this much crud. Going against the more gentle, conventional advise I decided to give matters a heavier hand. It took a few rounds of gel oven cleaner and lots of elbow grease but was worth all the toil. After this reboot I have my non-stick cast iron pan back— a handsome gun-metal skillet that’s worthy of seasoning. If you find yourself going down this road get these items together. Refinishing the outside of the pan is optional unless it’s rusted. More elbow grease than grease— a lye-based gel cleaner prepares the tarnished areas for scraping and sanding. Step 1: Spread out a layer of newspaper over your work area, this is gonna get messy. Coat the pan with gel-based oven cleaner and let it sit overnight (12-16 hours); this helps loosen the top layer of crud. Next day in a well ventilated kitchen, take the pan to the range and heat the skillet on low for five minutes. Wear a dust mask and avoid standing over the pan; turn on the exhaust fan if you have one. Step 2: Place the pan on a folded stack of newspaper, cooking side up. Hold the panhandle firmly (use a pot holder); with even pressure scrape the bottom of the pan with a chisel held at about 30° to the surface. Start by cross hatching the tarnish, work on the toughest areas then scrape following the pan’s circular shape; avoid gauging the metal. The goal is to loosen up the hardened layer— not to scrape it shiny clean. Stand the pan on its side and scrape the sides and the spout. Put on rubber kitchen gloves; Rinse well with hot water and scour with a steel wool pad then towel dry. A wood chisel and steel wool are equally as hard as cast iron. With pressure, softer carbonized matter easily scrapes away. Repeat Step 2 (maybe three times) until you see the metal come through the tarnished layer. You’ll find that the tarnish will crumble easily with repetition. Use a butter knife for tight areas where the chisel will not reach. Change newspaper as often as needed. Step 3: Coat pan with gel cleaner and allow to sit for at least two hours. Rinse well with hot water scouring with a steel wool pan and towel dry. The pan will still be mostly pitted and blackened but you’ll start seeing the dull gun-metal color coming through. Step 4: Place the pan on a folded stack of newspaper. With 80-grit sandpaper scour the cooking surface using a small circular motion; wipe pan clean with a paper towel and discard the dust. Repeat sanding until the pan is a fairly even gun-metal color and use new sandpaper as needed. Rinse with hot water and scour with a steel wool pad. If you still have more blackened areas repeat Step 3 and Step 4 as needed. Rinse well and towel dry. Your pan will never look band new, it will have random black spots and some mars; this is due to carbon that has bonded with the metal. Look what I found under all that tarnished, petrified gunk— the original grain from the casting and burnishing. Step 5: After rinsing, heat pan on high and lower flame. Melt about a two table spoons of a high-heat oil and smear all over the pan, inside and out. You can use peanut oil, canola oil, vegetable shortening, coconut oil, bee’s wax or even rendered lard— all these unsaturated fats work well. NEVER use olive oil for seasoning a pan, only for cooking; Olive oil has many resins and particulates that over time will create a sticky surface and will cause food to burn. With a paper towel coat all surfaces evenly and discard any excess and wipe clean. You only need a very thinly smeared layer of oil, not a dripping wet coat. A well seasoned cast iron pan is carbonized; carbon atoms bond to iron which help prevent rust and also harden the metal. Repeated heating and treating with high-heat oil creates a non-stick surface and over time. In about four months to a year (depending how often you use it) you will have a deep black, well seasoned non-stick pan that needs little maintenance. The pan’s color will change from dark grey, to deep amber then to pitch black. A little science is involved. When a high-heat unsaturated fat is exposed to 350-400°F temperatures the molecules break down easily and bond with available carbon atoms to form a water resistant polymer surface. It adheres to microscopic pores in the iron as a well as visible pits and scratches. Water soluble proteins are the usual culprit that cause food to stick to the pan when cooking, such as when you’re browning meat or frying an egg. This hydrophobic polymer surface allows cooking oil to spread evenly while preventing food from sticking. Most “pre-seasoned” cookware is treated with a wax coat for shipping purposes only, this prevents rust while in storage. They are not necessarily sold as “non-stick.” Some brands recommend coating with oil and then baking at 450°F as a quick method. A reconditioned pan will take less time to season than a new one. For the first two or three month avoid making acid-based foods such as tomato or lemon sauces, wine or balsamic vinegar reductions and sauerkraut or kimchee dishes. To clean, DO NOT use detergent, just rinse well with a scouring pad and hot water. Repeat Step 5 and store in a clean dry place... oh, and never lend out the good cast iron cookware to anyone going on a camping trip. 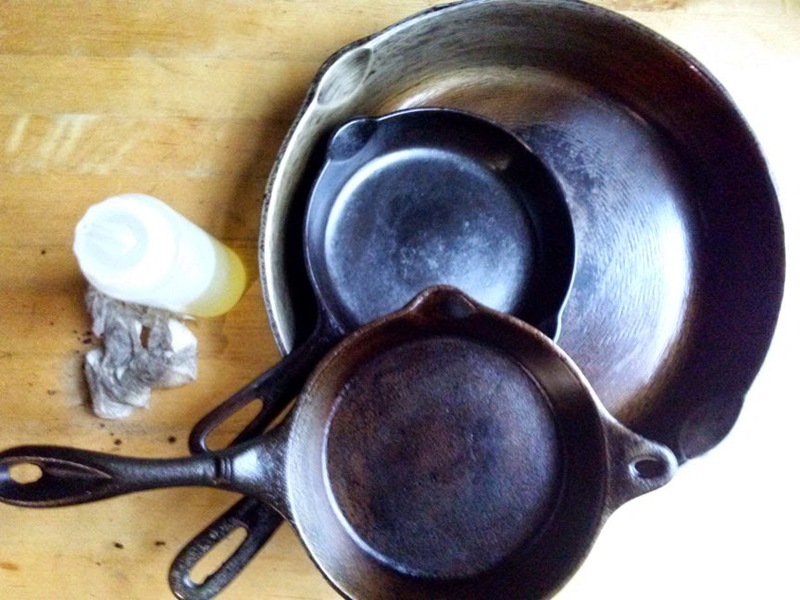 Black is beautiful indeed— over time your cast iron cookware will become non-stick and will need less care.